The Extended RAM Cartridge is an accessory for the Sega Saturn. It should not be confused with the Saturn Backup Memory, sometimes called "Backup RAM Cartridge", which, though looks virtually the same, has a completely different function. It should also not be confused with game-specific "ROM Cartridges". 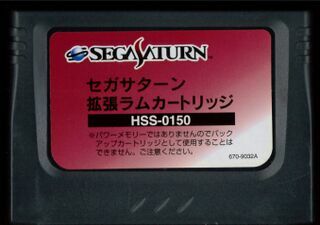 The Extended RAM Cartridge, as the name suggests, extends the Sega Saturn's "Work RAM" (random access memory) giving games the ability to work with more data in real-time. This is opposed to the Backup RAM Cartridge which extends a different type of memory - the internal storage used for save game slots. Some games require the Extended RAM Cartridge in order to function, whereas others can simply use it to enhance visuals. It is similar to the system employed by Nintendo's Nintendo 64 console, in which the "Controller Pak" can be used for saving and the "Expansion Pak" used for enhancing visuals (by adding RAM). The difference with the Saturn is that both accessories use the same cartridge slot, and thus cannot be used in conjunction with each other. Essentially this means that games which require the Extended RAM Cartridge must save their data to the console's internal storage memory, which is both limited in size and will be deleted if the internal battery dies. Two versions of the Extended RAM Cartridge exist, one which adds 1MB of RAM ("1.5 times" the normal Work RAM), and another which adds 4MB ("4 times" the normal Work RAM - the numbers can be disputed). Some games work with both, though some require the extra storage of the 4MB cart. On rare occasions, older games reliant on the 1MB cart will break if a 4MB cart is detected, leading to corrupt graphics. No Extended RAM Cartridges were officially released outside of Japan, however the Action Replay Plus (which was) has 1MB/4MB RAM functionality built-in, being able to detect which type of RAM cartridge is required. The Action Replay Plus is also considered to be the better plan due to the fact it functions as a Backup RAM Cartridge, cheat device and freeloader (allowing games from any region to be played on the system), and so saves the user the effort of changing carts as well as changing discs (unless the game requires a ROM Cartridge). Though no western games "officially" support the Extended RAM Cartridge, all versions of Marvel Super Heroes are compatible with the peripheral regardless of region. If the game required the Extended RAM Cartridge, it was made available in a RAM Cartridge bundle. There are also numerous Saturn third-party RAM cartridges. (The demo discs of Samurai Spirits Amakusa Kourin Hibaihin, The King of Fighters '97 and Vampire Savior support the cartridges in the same way their full counterparts do).